Sony has introduced its new line-up of BRAVIA HDTVs at CES 2011, and this time the emphasis seems to be as much on mobile and interconnectedness as it is on the quality of the TV picture. In previous years, the HDTV craze was all about 3D (last year) or thinness (2009), or even just the quality of the screen in terms of deeper blacks and who had the highest contrast ratio. For 2011, the emphasis has shifted towards making the HDTV an integral part of a connected home entertainment setup, and Sony’s latest line-up fully reflects this. Still, with no less than 27 different new models being announced, there’s bound to be something for everyone! 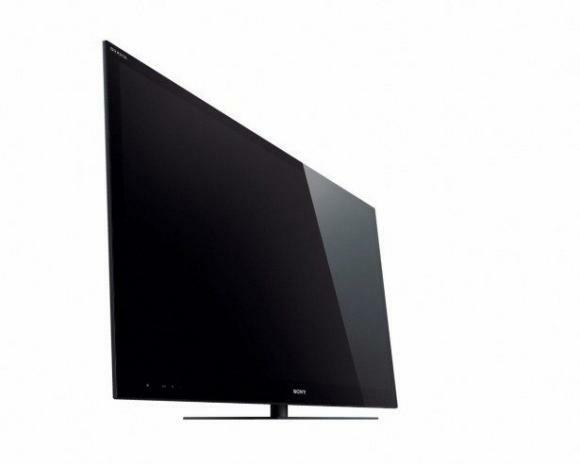 Sony has added 16 new 3D HDTVs and 22 new 2D models, with screen sizes ranging from 22″ to an unbelievable 65″. All except the lowest two ranges either come with Wi-Fi built-in or are Wi-Fi ready with the addition of an extra Wi-Fi dongle (sold by Sony and which plugs into the TV’s USB socket). Some of the higher-end models even have Skype built-in, which, with the addition of a camera and microphone (both sold separately, naturally! ), means you can make Skype calls from your HDTV (yes, even the giant 65″ one!) to any other Skype client in the world. That’s a pretty neat feature. Other new features include a new Track ID feature powered by GraceNote, which lets you identify any music you hear while watching TV. A nifty feature this, and it’s only a matter of time before Sony link the discovered artist through to a store where tyou can instantly purchase it! In a sign of the increasing pervasiveness of mobile phones, Sony has also announced a new series of iPhone and Android apps that will let you use your smartphone as a remote control (presuambly via DLNA). This will be a life-saver, as using YouTube on a Sony remote without a QWERTY keyboard is an exercise in futility! The final feature on offer comes from the 3D models, which will be capable of displaying 3D images taken from Sony’s 3D CyberShot cameras. Of course, a 2011 Sony TV has to look better than a 2010 model, and so its engineers have come up with a variety of new ways of making your humble TV picture look as perfect as possible. To this end, the critically acclaimed BRAVIA processing engine, which already does an excellent job of upscaling standard def pictures, has now been enhanced and comes with the new X-Reality PRO and X-Reality Engine video processors. These use algorithms that take video processing to new levels, which helps to make the resultant image look almost as good as it does on BluRay. There’s also the new Intelligent Peak ELD Backlight, which gives deeper blacks by using full local dimming and so increases picture contrast considerably, making pictures look incredibly detailed. Finally, there’s Sony’s MotionFlow XR, which helps to reduce the motion blur that’s typically found in LCD and LED TVs. OK, with that out the way, here’s the full range of Sony’s new HDTVs for 2011. Available in April, Sony’s new 3D capable (with the addition of Sony active shutter glasses, sold separately), XBR-HX929 series features brilliant full HD (1080p) picture quality with Sony’s Intelligent Peak LED backlight for outstanding contrast. The model also features Sony’s MotionFlow XR 960 featuring a precise backlight control that is synchronized with the liquid crystal movement from frame to frame creating clearer, sharper moving images. The beautifully designed model features Sony’s improved Monolithic Design Concept that draws viewers into the picture when the TV is turned on, and blends into the room décor when turned off. The 2011 Monolithic Design BRAVIA models incorporate Corning®’s Gorilla® Glass allowing for thinner, lighter, and stronger screen material. With integrated with Wi-Fi (802.11n), the XBR-HX929 models offer instant access to thousands of Internet movies, videos and music from BRAVIA Internet Video and Qriocity. Sony’s Media Remote app provides simple operation and search for internet content. The XBR-HX929 models are also custom installation friendly with key features such as rear IR-input and a two-way RS232c connection for easier integration with third-party control systems.